AN accident ,which occurred around academy area on Lagos/Ibadan expressway on Saturday afternoon, claimed the life of the mother of an unidentified bride and an unidentified passer-bye. 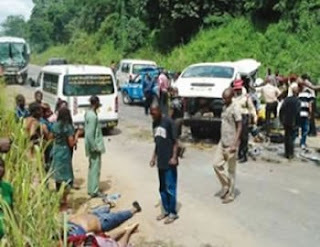 The mother of the bride, who got married in Ibadan at the weekend, was said to have died on their way to the reception around 2.00pm on Saturday afternoon around Academy, area, along Lagos/ Ibadan expressway. An eyewitness, who informed Sunday Tribune, said that a silver coloured SUV (Sub Urban Vehicle) coming from Iwo-road side, and believed to be heading towards the reception, lost one of its tyres while the driver lost control of the wheel. The development, it was gathered forced the driver, whose identity was unknown, to have a minor brush with the car before it swerved off the road. The accident immediately led to the death of two occupants of the car, with registration number Lagos KJA 112 BQ, the mother of the bride and a passerby. The bride’s mother was identified as “Saidat Iya Kola” at the scene of the accident as people ran belter skelter, panting with the story of the deceased.